Meanwhile a handful of spectators gathered at the picnic table waiting for loved ones to land. Music played inside as folks moved about and soon "The Shark," a gray single propeller airplane with big shark teeth landed on the actual runway. Inside the hangar was an explosion of color, a ginormous American flag, mementos peppering the walls and a ceiling made of parachutes. Seasoned jumpers packed their chutes as new skydivers weighed in at the manifest check-in and their names were added to the "Departures" board. I never knew this existed in Kansas. Then there was Jen. "Katy and Keri?! Welcome to Skydive Kansas!" I was nervous just at the identification that I was actually here to skydive-but I hid it with a big goofy grin (which I think stayed on my face the entire time until I landed). 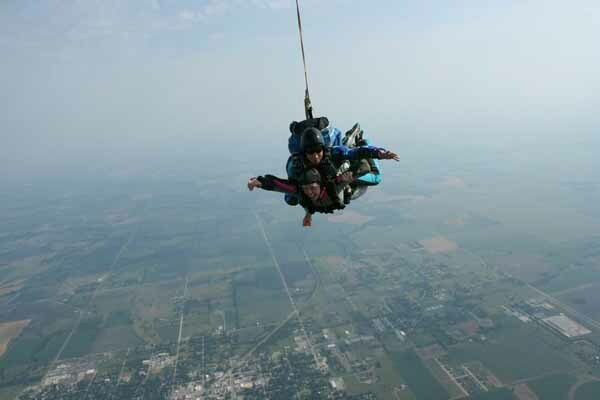 Jen Sharp is the owner of Skydive Kansas and a jumper extraordinaire. In fact, upon meeting her she began telling us about her recent world record, which she gained on a jump in Chicago. With well over 3,300 jumps, I found comfort in her entire operation and training us on this particular day. I&apos;ve always said I wanted to skydive, but hadn&apos;t taken the plunge yet. So here I am, in the name of Kansas Tourism, about find out what skydiving at 10,000 feet above our picturesque landscape feels like. After about 40 minutes in the training room, where we watched a short film on the tandem skydive process, we practiced getting into position to jump with a simulated airplane door, and performed our arch and landing positions. Before I knew it we were suiting up and meeting our tandem instructors. At this point I realized how simple skydiving is ... sort of. At Skydive Kansas, they do a great job of preparing first time jumpers for an experience that will undoubtedly not be like any other. Instead of going through every minutia of skydiving, it&apos;s straightforward for this one jump. Enter the instructors. Sharp&apos;s fleet of experienced, animated, kind, funny tandem instructors are ultimately what make this experience. I was paired with Emily Royal, who has over 900 jumps in just eight years and had just returned from jumping in Colorado. I was so curious about this hobby of hers that the questions just rattled off: Why aren&apos;t the flight suits heavier? What kind of shoes are best for skydiving? What do your parents think? Will my contacts fall out? Did you train your husband to skydive? Can I see Topeka from here? She put all my gear on and explained it in the process. Once she was set to go, we loaded up on the Shark and started our 20-minute ascent to 10,000 feet. Things began to slow down and the thought of jumping from a plane began to flood my thoughts. As I watched the dial spin on the altimeter, I caught myself enjoying an intimate view of Kansas. At about 6,000 feet we began to strap ourselves together and prepare for the descent. My friend Keri was with me on this particular day, also suited up and crossing an item off her bucket list. It wasn&apos;t until I saw her jump first that I was consumed with nerves. Seeing her last little hand wave followed by her jump into free-fall had me holding on to the sides of the door a little tighter. Emily shouted, "Are you ready to skydive" and I shouted back, "I am ready to Skydive!" My legs were already arched under the plane, I was gripping my harness and Emily rested my head against her shoulder for the initial jump and then ... we were flying. I know I was smiling the entire time and screaming, but it was incredible. You could see for miles, the land was small but it wasn&apos;t, I felt free, I felt liberated, I felt like a bird. Emily moved my head to catch a glimpse of the photographer during our 40-second free-fall. I looked at Matt (who is also Emily&apos;s husband), I looked at the land and the sky and my altimeter and at 5,000 feet Emily pulled our parachute. We were now in canopy and I was just amazed. I thought to myself, how awesome to have this job where you get to witness people do this for the first time. As we soared toward earth we did a few spins, enjoyed the ride and glided back down safely into Skydive Kansas&apos; front yard. I was Emily&apos;s 908th jump and she was my first, all for one epic Kansas experience. Photo courtesy of Skydive Kansas. Katy Ibsen is a writer and editor living in Lawrence. When she&apos;s not blogging, writing or serving her community, she&apos;s embarking on the outdoor life among Kansas&apos; picturesque landscape. 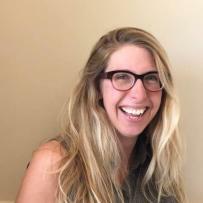 Katy Ibsen is a writer and editor living in Lawrence. When she's not blogging, writing or serving her community, she's embarking on the outdoor life among Kansas' picturesque landscape.